Chicago: it's my kind of - belch - town. 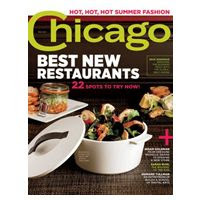 And for proof, look no further than Chicago Magazine's latest issue, pointing you to the city's 22 best, new places to hang out and chow down - perfect timing for the CreComm Chicago trip just one week and three days away. But who's counting?